The yellow building permit card must be posted on the job site. The address number must be posted at the County Road or street. Your copy of the approved plans must be on the job site for the inspector's review for the inspection to be performed. A $48 re-inspection fee will be required if the permit card and plans are not on site for the inspection. This is for the inspector's time and extra trip required returning for inspection. 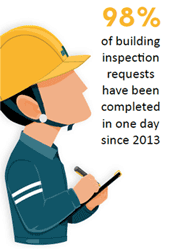 The Building Inspector may also assess the re-inspection fee in cases of repeated trips on correction notices or as deemed necessary. Most areas of Larimer County are inspected daily. There is one area that is Monday, Tuesday and Thursday only while another is Wednesday and Friday only. If you are not sure which area applies to your permit, call our offices at (970) 498-7700. To request an inspection please call (970) 498-7697 or use our online Customer Access Portal. You must have the permit and IVR numbers to schedule inspections via phone only. Requests confirmed before 11:59 PM can be done the next working day. Requests received at 12:00 AM or later will be conducted no earlier than the day after the next working day. Caissons must be inspected by the engineer of record, with a wet-stamped letter approving the caissons given to the inspector. If an open hole inspection is required by your design engineer, you need to contact that engineer for an inspection after the crawl space or basement is excavated and prior to forming footing to make sure the soil and water table are per design perimeters. At the time of footing and setback inspection, if you are in a Wildfire hazard Area, the initial Wildfire Inspection is required. Please note when calling in for the inspections that Initial Wildfire inspection needs to be conducted. Refer to pages 16-18 for Wildfire Safety information. If a surveyor certification is required under this permit (see conditions of approval on permit card) it must be provided at the time of the foundation inspection. Certification letter required from contractor that dampproofing and exterior perimeter drain installed per code and need to be submitted at the time of framing inspection. Underground plumbing inspection is required after all drain, waste, and vent pipe (below and up to grade) is in place, visible and under test. The water supply line is to be stubbed into basement or crawlspace. Wrap all plumbing where it will penetrate slab. Water test – The water test shall be applied to the drain, waste and vent system either in its entirety or in sections. If applied to the entire system, all openings in the piping shall be tightly closed, except the highest opening, and the system filled with water, but no section shall be tested with less than a ten (10) foot head of water. The water shall be kept in the system, or in the portion under test, for at least 15 minutes before inspection starts. The system shall not show evidence of leakage. Air test – The air test shall be made by attaching an air compressor testing apparatus to any suitable opening, and, after closing all other openings to the system, forcing air into the system until there is a uniform gauge pressure of five pounds per square inch. The pressure shall hold without introduction of additional air for a period of at least 15 minutes before inspection starts. If a radon mitigation system is required for this parcel (see conditions of approval on permit card) the subslab work must be ready at the time of underground plumbing inspection. The floor slab cannot be poured until this is completed. If you have a walk-out basement, slab insulation is required by the Energy Code. The perimeter insulation must be ready at the time of underground plumbing inspection and the foundation cannot be backfilled until this is approved. Narrow wall bracing inspection is required where less than 2 feet of structural wood sheathing is installed by garage or window opening. Inspection called for before weather barrier and siding installed and certification on sheathing fasteners signed and on site. In addition, porch roof or deck framing (such as columns that may be wrapped or roofs that may be soffited) must be inspected before being covered. Required when listed as one of the conditions of approval of the subdivision. Inspection of all below slab radon piping before slab is poured. Remainder of radon mitigation inspection will be inspected at time of rough-in inspections. All items to be placed in slab are in place and soil is compacted. Concrete cannot be placed before inspection approval. Top out inspection to be made after all required drain, waste and vent piping is in place. This inspection shall be done before or during framing inspection, after the flue vent, heat ducts, and heater combustion air and exhaust ducts are in place. Clearances and venting shall be as required per the manufacturer's listing and these listings must be at the job site for inspection. Heating and cooling equipment sized per Manual J and ducts sized properly. Rough Piping Inspection – This inspection shall be made after all gas piping authorized by the permit has been installed, and before any such piping has been covered or concealed, or any fixture or appliance has been attached thereto. This inspection shall include a determination that the gas piping size, material, and installation meet the requirements of the Code. A pressure test must be performed by the owner. This pressure test, including pressure gauge, is supplied and installed by the owner and checked by the Inspector. The gas piping shall stand a pressure of 10 pounds per square inch gauge pressure. To verify no leaks exist on the line, the 10 pounds must not fluctuate and the inspection will not pass if the gauge is at 12 pounds or 8 pounds (i.e. 10 pounds must exist—no more, no less). For propane from tank to house pressure regulator, 30 pounds required if any joints exist in the line. Provide 18" depth for copper, polyethylene pipe (PE requires an 18 ga. tracer wire or metal tape), and factory wrapped black iron. (Field-wrapped pipe cannot be installed underground.) If using an elevated pressure system (2 psi or greater meter set), a 30# pressure test is required upstream of the regulator. Regulator will be checked at final. Final Piping Inspection – This inspection shall be performed after all gas piping authorized by the permit has been installed and all fixtures, appliances or shut-off valves have been attached thereto. A shut-off valve for each appliance and at outside of mobile home is required. Woodburning fireplaces must comply with county clean-burning emissions requirements. Zero clearance fireplace or wood stove vent inspections will be made during heating and vent inspection. Masonry fireplace inspections (a) firebox, throat and damper are in place, and the first flue tile is ready to be set; and (b) after all flue tile is in place before capping. Wood stove chimney to be installed and inspected at time of heat and vent inspections. The wood stove must be in place at time of final inspection or vent capped off in a finished manner. Listed wood stove installation instructions must be on site for final inspection so clearance to combustibles and venting can be verified. Clearances to combustibles can only be reduced with a listed reduced clearance assembly (i.e. from Durrock TM or Wonderboard TM), or the manufacturer's listing. The complete house should be framed, all windows installed and outside weather boarding complete. Roofing complete, fire blocking and bracing are in place, plumbing and heating pipe and ducts are completed. Stamped truss engineer's drawings and truss layout must be with county-approved plans for inspector to check truss bracing. All structural lumber must be graded. All required engineer's letters on footings and foundation, and perimeter drain, dampproofing/waterproofing, roof and wall certifications must be on site for inspector. Called after roofing completed and need to leave proof of Class A or B label in the foothills or mountains and Class A, B, or C along the front range. Certification letter from roofing contractor that roof fasteners installed per manufacturer's requirement for appropriate wind speeds of Larimer County and roof ice barrier was used in the high wind area. After frame, rough-ins, electrical inspections are approved or authorized to insulate by your inspector, and U-factor labels left on windows and skylight until insulation inspection approved. All walls insulated and all penetrations to the building enveloped sealed, caulked, gasketed weatherstripped or otherwise sealed at the following: All joints, seams and penetrations; Site-built windows, doors and skylights; Openings between window and door assemblies and their respective jambs and framing; Utility penetrations; Dropped ceilings or chases adjacent to the thermal envelope; Knee walls; Walls and ceilings separating the garage from conditioned spaces; Behind tubs and showers on exterior walls; Common walls between dwelling units; Attic access openings; Rim joists junction; and Other sources of infiltration, such as, recessed lights must meet one of the following conditions: Type 1c rated with no penetrations between the inside of the light fixture and ceiling cavity. Type 1c or non-1c rated and installed in a sealed box constructed from gypsum wallboard or other approved assembly. Type 1c rated, tested and labeled to being "airtight". Class I or II vapor retarders must be installed on the interior "warm-in-winter" side of all non-vented framed ceilings, walls and floors. Typical methods used are: Kraft-faced insulation, polyethylene sheeting and vapor retarder primers/paints. Supply ducts located within unconditioned crawlspaces, basements, attics, and framed wall cavities shall be insulated to R-8 and return-air must be insulated to R-6.0. All duct joints, longitudinal and transverse seams, and connections in ductwork, shall be securely fastened and sealed with welds, gaskets, mastics (adhesives), mastic-plus-embedded-fabric systems or tapes. Tapes and mastics used to seal ductwork shall be listed and labeled in accordance with UL 181A or UL 181B. Duct connections to flanges or air distribution system shall be sealed and mechanically fastened. Unlisted duct tape is not permitted as a sealant on any metal ducts. Blown attic insulation will be inspected at final inspection, as will exposed insulation blankets attached to unfinished concrete walls in the basement and crawl spaces. Do not cover any unresolved corrections from previous inspections. Required only where fire-resistive-rated construction is required between dwelling units and when exterior walls within three feet of property line. Firewalls when required to be inspected will be made after gypsum board is in place, but before plaster or gypsum board joints and fasteners are taped and finished. All wood residential structures will be required to have a weather-resistive barrier. First Certification letter certifying that the installer wrapped windows, doors, and wood sheathing according to ICC acceptance criteria and their manufacturer's installation requirement. Second Certification letter is certifying that the sealant is installed per ICC acceptance criteria and their manufacturer's installation requirement. Final Inspection – To be made after finish grading, and the building is completed and ready for occupancy, and final electric is signed off by state inspector. (Carpet and other floor coverings, trim and doors except to garage do not need to be completed for full CO.) All applicable conditions of approval, such as Drainage Certification, radon test, etc, must be provided for full certificate of occupancy. Temporary Certificates of Occupancy (TCO) may be issued, but only when all life-safety issues have been addressed and a TCO fee paid. There will be a $600 fee for temporary certificate of occupancy. A Temporary Certificate of Occupancy shall be valid for six months. If a full Certificate of Occupancy is issued within the first month, all but $40 will be refunded. If a full Certificate of Occupancy is issued prior to the six month expiration, $100 shall be refunded for each full month remaining out of the original six month validity period of the Temporary Certificate of Occupancy. Once all final inspections are received, a certificate of occupancy is issued for residential and commercial permits. Certificates of occupancy are not issued for cabins, however a Letter of Completions is issued. Accessory structures, such as barns, garages, or storage buildings may request a Letter of Completion when final inspection has been approved. If you are unsure as to which final inspections are required prior to certificate of occupancy issuance, please contact our offices. The Building Official requires inspectors to charge $48 for an inspection that is not ready as requested. The $48 charge will not be assessed if the office is contacted and the inspection is canceled before the inspector arrives. Please call as early as possible to prevent this fee from being assessed.